Dansby Swanson, Atlanta Braves - Dansby Swanson continues his assault on opposing pitchers with a three-run homer off of German Marquez on Tuesday. The homer gives Swanson four homers and 15 RBI, both team highs for the red hot Atlanta offense. Swanson has hit primarily out of the 8th spot in the lineup this year but now has back to back games in the six spot in the lineup, with one game facing a righty and one facing a lefty. Swanson appears to be fully healthy once again and ranks in the 93rd percentile for hard-hit rate, 94th percentile for xwOBA, and 83rd percentile for exit velocity according to Baseball Savant, so nothing about his start his fluky but we just need to see Swanson do it over an extended period of time. Maikel Franco, Philadelphia Phillies - Maikel Franco hit his fourth homer of the season on Tuesday as he continues his excellent start to the season. Franco is slashing .294/.442/.706 with a 20% BB% against just a 4.7% K% through 43 PAs. There are some concerning notes in Franco's profile though as he ranks in the 6th percentile in average exit velocity (82.6 MPH) but still has an xwOBA in the 57th percentile because of his ridiculous 22-degree launch angle. Right now he's doing okay because of that launch angle plus a 48% fly ball rate, but without an uptick, in hard contact, he's going to see that batting average plummet fast if he doesn't keep hitting only fly balls. Stephen Strasburg, Washington Nationals - Stephen Strasburg's rough 2019 continued Tuesday getting shelled by the Phillies for six runs over four innings. He allowed six hits, two homers, and four walks while striking out just three batters. Strasburg has now allowed 10 runs over his 16.2 innings and has seven walks as well in that span but has been able to generate over a strikeout per inning over this same span. Strasburg is getting hit really hard this year with a hard hit percentage in the 11th percentile, and it's the third straight year that his average exit velocity has been trending the wrong direction. It's still early in the year so a few outrageous numbers can influence the sample size a huge amount, but when we have seen it happen for three straight years it gets concerning. He does though have a 14.7% swinging strike rate and a 51% ground ball rate so there are a few positive items that we can note here. 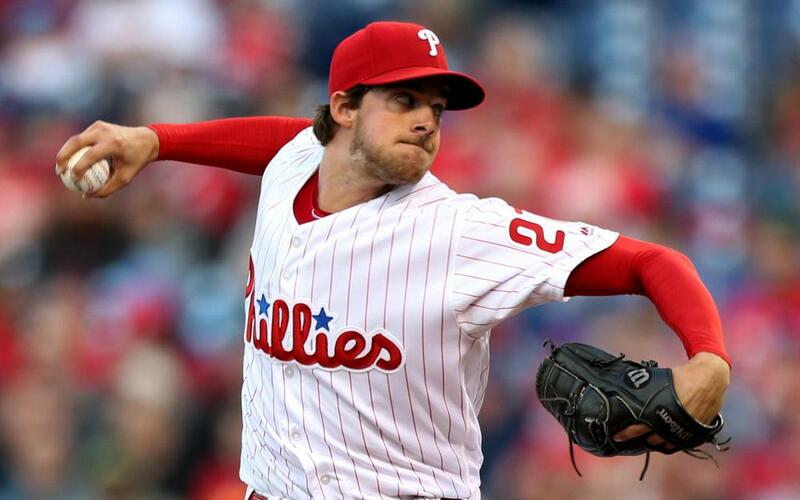 Aaron Nola, Philadelphia Phillies - This one hurts my soul.... Aaron Nola struggled again on Tuesday allowing seven hits and five runs (four earned) over 6.1 innings. Over his last two starts, he's thrown 9.1 innings and allowed 10 runs and five homers while striking out just five batters. It's hard to find a lot going positive right now for Nola, especially looking at his rankings on Baseball Savant. He ranks in the 61st percentile for strikeouts, 35th percentile for hard-hit rate, 23rd percentile for exit velocity, and 31st xwOBA which is all far from the ace we expected him to be coming into this season. The only thing in Nola's pitch mix that is a little different is he's cut his sinker usage down by 5% to 9.3%, and his four-seam fastball usage rate is up by 11%, so he may benefit from backing off of that fastball and getting back to incorporating more of his other pitches. Max Fried, Atlanta Braves - Max Fried turned in a second straight strong start for the Braves on Tuesday, this time in Colorado allowed one unearned run over 6.0 innings while allowing just five hits and striking out four. Fried didn't have a ton of swing and miss stuff this game with just nine swinging strikes but he was able to generate a 50% ground ball rate, an impressive feat at Coors Field. His strikeout numbers are extremely middle of the road, but he's doing everything else extremely well and has a wOBA of .087. He earned this start after having a terrific outing against the Cubs and he 100% has earned another with this one. Sean Newcomb and Julio Teheran are the ones who need to be nervous with Mike Foltynewicz and Mike Soroka nearing return, not Fried.